I've been really trying not to turn to recipes for my crafting posts this Christmas because they always seem to be cake-related, and I always end up eating them. Not because no one else wants them, but because I never gave anyone else the chance to have any. Because I like food. But this is one of only two Christmas recipes I'm posting this year, and neither of them are cakes. In fact, they're both delicious but both clean, so if I do eat the lot, so be it! I'm making the effort this year to try to find healthy alternatives to festive food, not to replace them but to balance out the inevitable and wonderful indulgence that is Christmas. I put a post together a few days ago featuring a few of the things I'm turning to, and this recipe was noted on there, too! Yet I've never actually had chestnuts at Christmas in any way, shape or form. Not knowingly, at least, and so I had no idea what chestnuts actually tasted like. They're a lovely mix of sweet and nutty, and I have actually decided that I love them. So rather than continue with my original plan, which was to make my own spiced fruit date bars, I decided to use chestnut flour instead and make festive chestnut date bars. And then made them bites instead. And they only take four ingredients, all of which are natural, and, for those interested, gluten free, dairy free, raw and organic. The image below shows the brands I used, simply because they were the first I'd found. Don't get confused, this post isn't sponsored by any of them! 1. 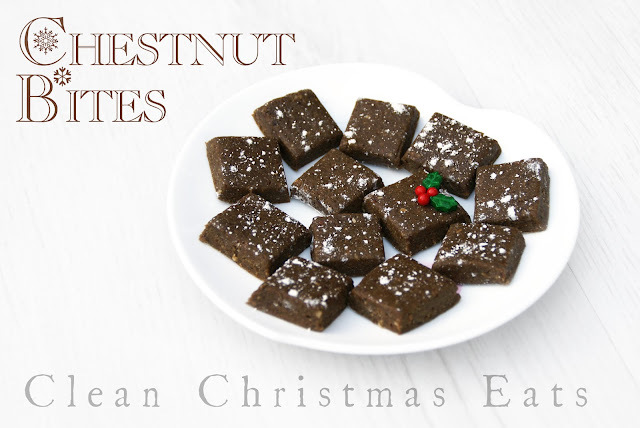 Chestnut bites are so easy to make. Put all of the dates into a blender or food processor and switch on for about 15 seconds. Add the chestnut flour, cinnamon and hemp flour and mix again. The dry ingredients will fly everywhere and it might seem a bit dry for a moment, but let it keep mixing. Switch it off after about 30 seconds and scrape down the sides if you'd like, then switch it back on. I'd never made anything like this before and thought it was all going wrong, but I just kept mixing it and it all soon formed a nice ball. 2. 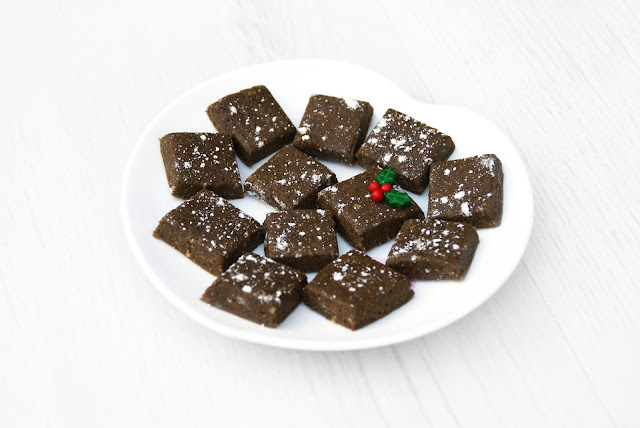 Remove your mixture from the blender or food processor and dump it on a sheet of grease-proof or silicon paper, then put another piece on top and roll the dough between them into a 4x4 inch square. This mix doesn't make a huge amount, as you can tell from the size of the square, but it does avoid potential spoiling or waste, and it's easy enough to increase the mixture. 3. Set the flattened dough into the fridge for a few hours, then remove and cut into 12 1-inch pieces. The easiest way is to cut it in half, then rotate it 90 degrees and cut it in half again, then do the same for those four squares. I finished mine with a small sprinkling of chestnut flour (which is white). I also added a few Wilton holly sprinkles to festive it up, but this is entirely optional.